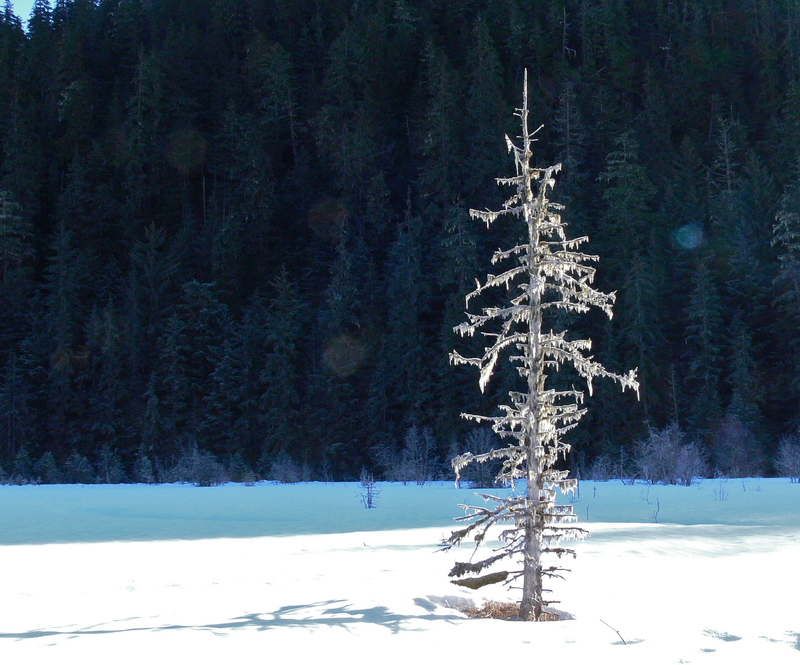 Aki would have loved this sun soaked meadow of snow. She might have shown concern or distain when I broke through a snow bridge and plunged into a foot deep stream. I am glad she missed that part. It is enough that I must ski all the way to the car with one very wet foot. The taste of spring hangs in the air over Amalga Meadows. One big rain storm will push it into spring. 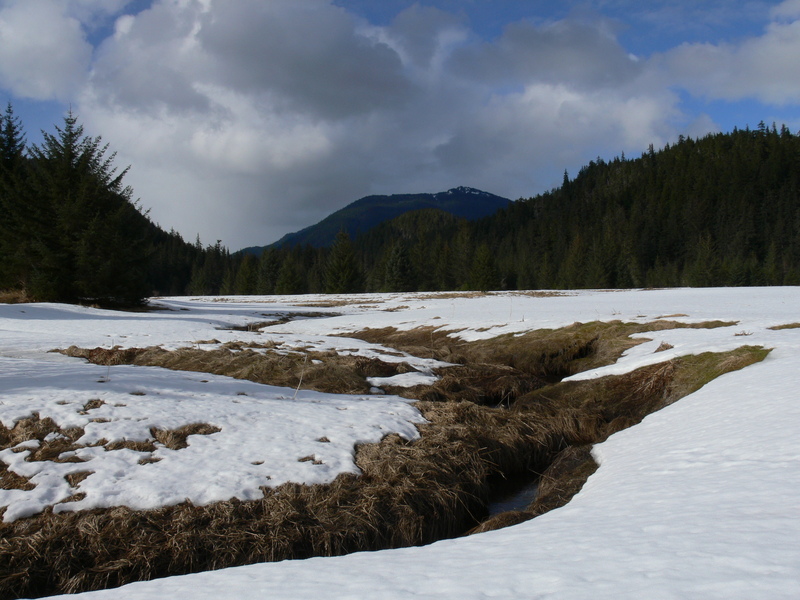 Now mud and snow fight it out for the high ground while watercourse ice rots to liquid. Even now a long tongue of open water reaches halfway across the salt chuck. Pushing past the stream of my rude baptism and deeper into the meadow, I find only silence. 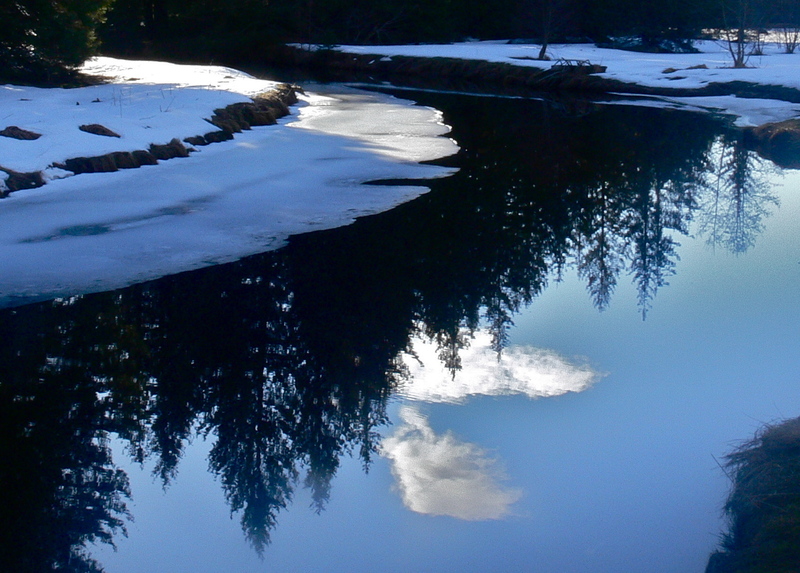 Expecting the chatter of chickadees I only hear melting snow drops hitting gentling moving water. It pleases rather than disappoints. Later I ski over over a little hill to a pocket beach to test a theory. Without Aki will the ducks and birds relax around me? No. 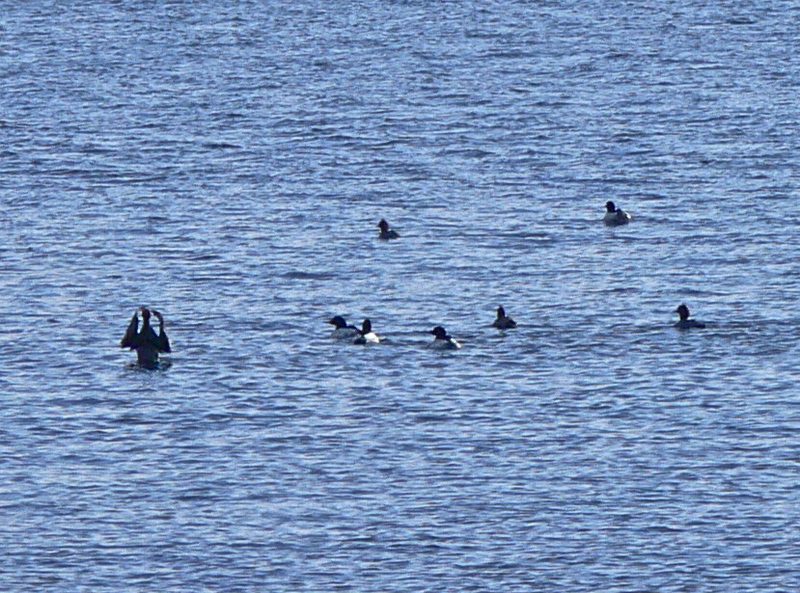 A small gang of mergansers relaxing on the beach re-enter the water when I am still in the woods and paddle to the middle of the bay. They leave me with a woodpecker pounding out food from a beach side spruce. Without seal lions or seals to keep them pinned to the beach the mergansers form an raft with a mix group other of ducks. Their muttering mixes with the sound of the woodpecker’s impact drill and periodic splashing by something I can’t make out. A photograph shows something like a duck doing the iron cross. I’s guessing cormorant. 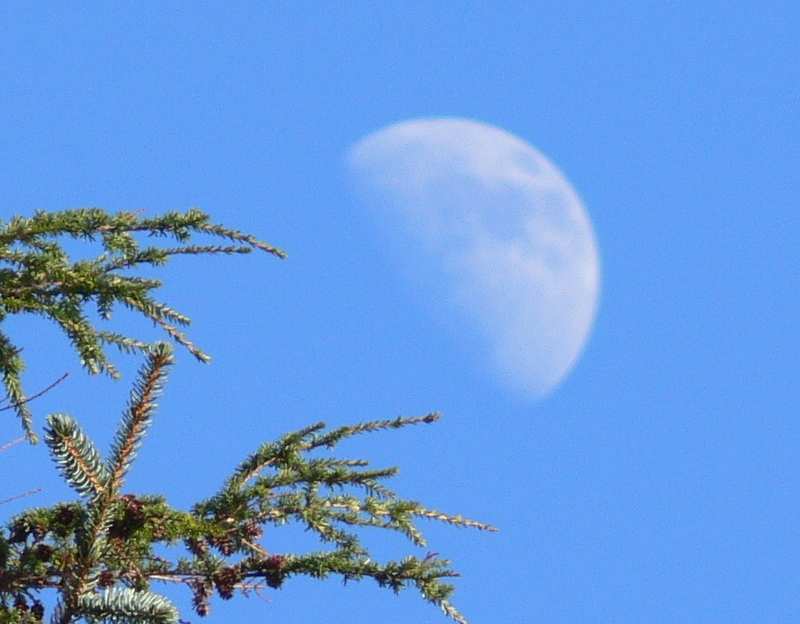 Turning back from the beach I search for the woodpecker and notice a rising half moon emerging from behind a spruce. It wears a toupee of clouds. He is bald before I can snap a picture. 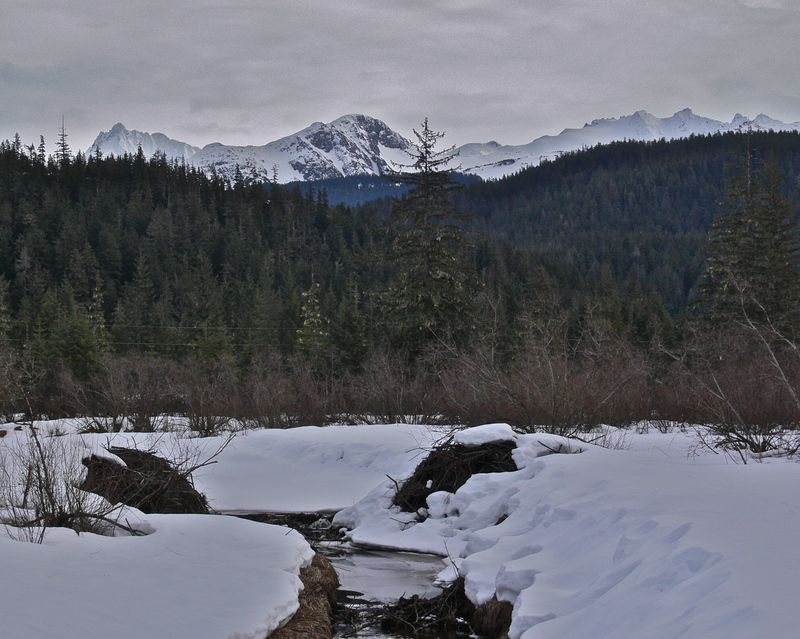 This entry was posted in Dan Branch, Juneau, Kwethluk, Nature, peaceful isolation, Southeast Alaska on March 31, 2012 by Dan Branch. I should be disappointed that clouds have replaced the sunny blue skies that blessed Juneau this morning. But overcast often hangs over our rain forest. The clouds raised the temperature to near 50 degrees so I leave my jacket in the car and join Aki for a skiing investigation of this great open meadow. After dashing about and rolling in the snow Aki settles into a patience pace by my side. Almost two feet of compressed snow still cover the meadow promising a late Spring for the wild flowers below. It easily supports our weight making skiing a matter to be done without stress or thought. We have the place to ourselves. No recent animal or people tracks dimple the snow. Finding that solid ice still covers the meadows’ watercourses I drop down into one and ski over to the beaver housing complex. The ice ends there and stream water sings a calming song by flowing over a dam made of gnawed tree limbs and sticks. The beaver’s huge pile of feed wood sits at one end of the dam and a snow covered den at the other. Near here three or four shafts, maybe 12 inches across, drop to the meadow surface. I probe one with a ski pole and find a small tunnel entrance at the shaft’s center. Small concave shelves have been fashioned just beneath the snow’s surface, which makes me suspect it to the be the work of land otters. I can just see then nose out of their home tunnel, place front paws on the shelves and launch themselves onto the snow. There should be a rutted trail of tracks leading from the escape shafts to an otter slide down to the steam ice. There should be an otter sized hole chewed into the ice. 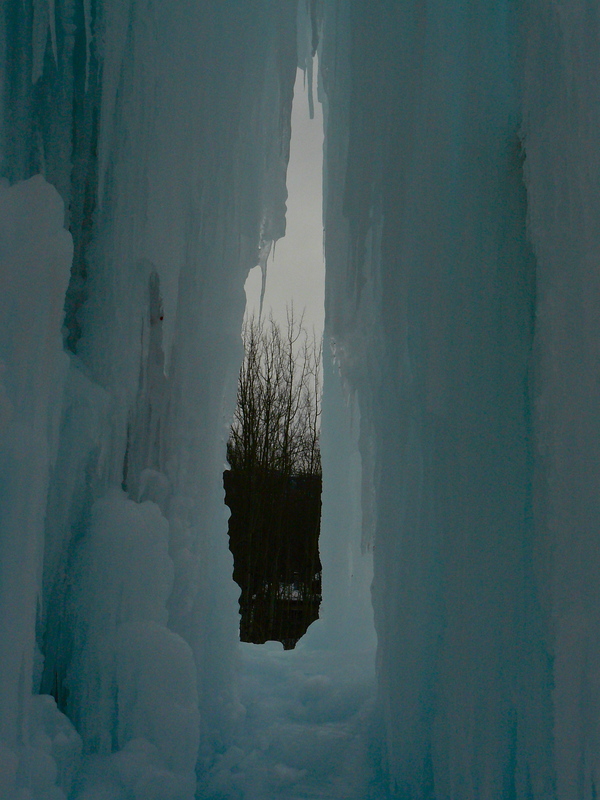 We have seen slides and opens holes in the ice here before. Maybe the otter clan has moved over to the salt chuck to fatten up on last Fall’s salmon fry migrating to Favorite Passage. Many willow bushes dot the meadow. Some mimic English tea roses with objects looking like fully formed flowers that might draw a second look from a florist. These miracles were not produced with the wave of a wand but rather the invasion of the willows by a parasite. Midges formed the flowers or gall for shelter for their larva. 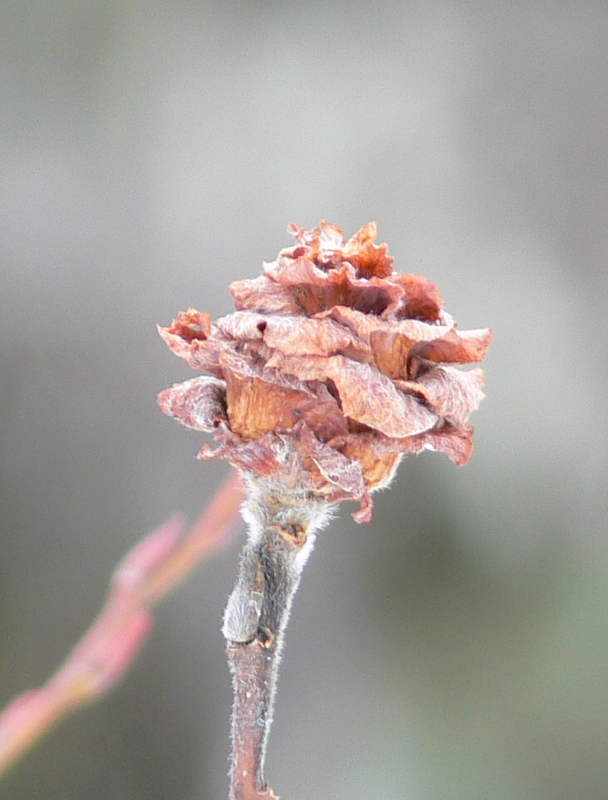 Green in summer these galls have now dried to a convincing rose shape the color of dried blood. 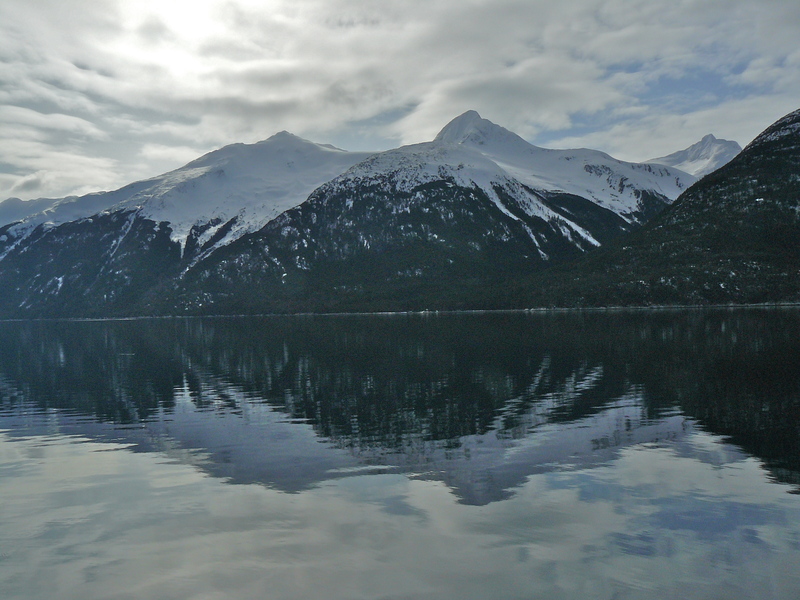 This entry was posted in Aki, Dan Branch, Juneau, Kwethluk, Nature, peaceful isolation, Southeast Alaska on March 28, 2012 by Dan Branch. The quiet peace on this late winter day makes me suspect history. 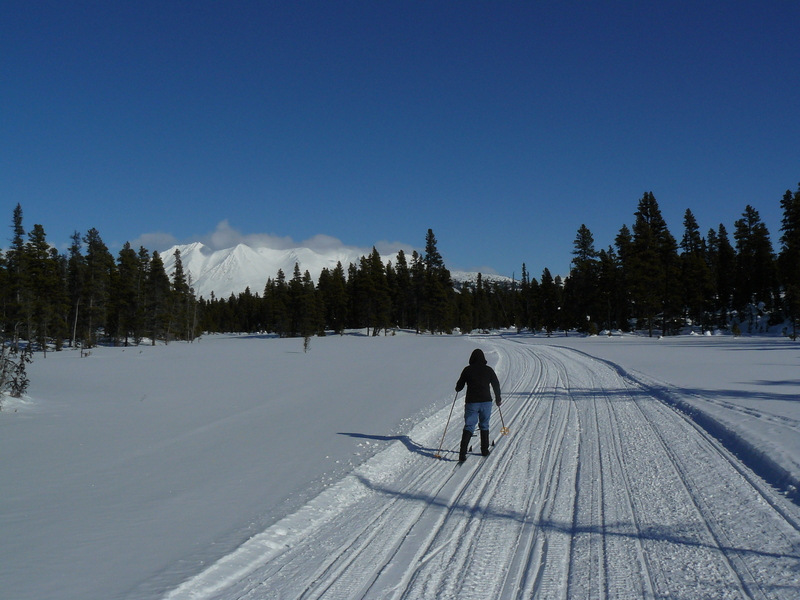 Again we ski between the famous White Pass and Lake Bennett — both reputed choke points during the Klondike Gold Rush. Later we will cross the US Canada border and drop the precipitous 14 miles to Skagway, which tries hard for the summer tourists, to look like its 1898 self. Only these battered railroad buildings, just managing under great caps of snow, even hint of the famous rail tracks beneath. During other visits here I could almost hear the stampeders’ cross cut saws reducing the forest. Today, perhaps stunned by the warm windless day and the cloudless ski, I think of little but the ski. Two days ago a couple hundred skiers raced each other on these trails. 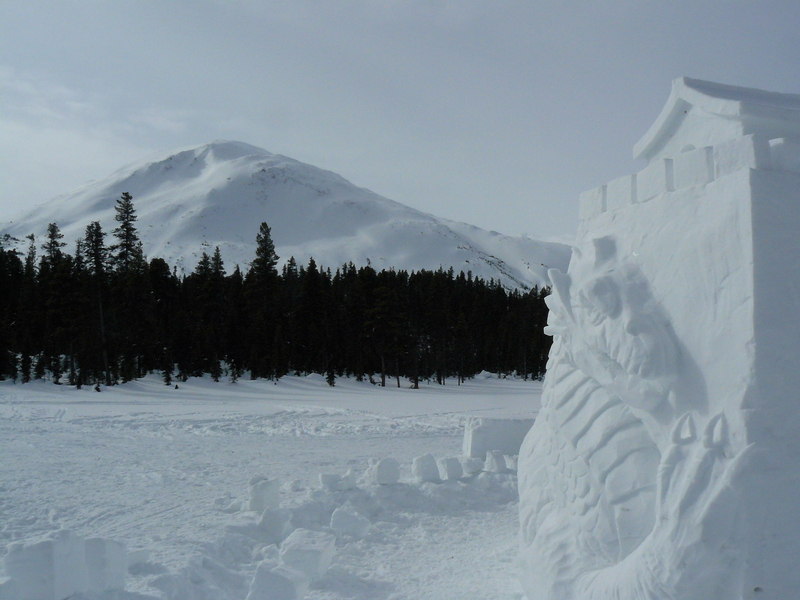 You can still enjoy the dragon crested replica of China’s Forbidden City they made of snow blocks. Tibetan pray flags still flutter their colorful warning at the summit of the steeper drops. We ignore caution and fly down under the flapping prayer then glide onto a large flat meadow to gaze at a nearby string of mountains. Concentrating on the mountains I ignore the single set of tracks made by a large running animal that marks the meadow. After settling into the ski rhythm I start thinking of all the beauty we had seen on this trip but run out of time before cataloging more than today’s experiences. 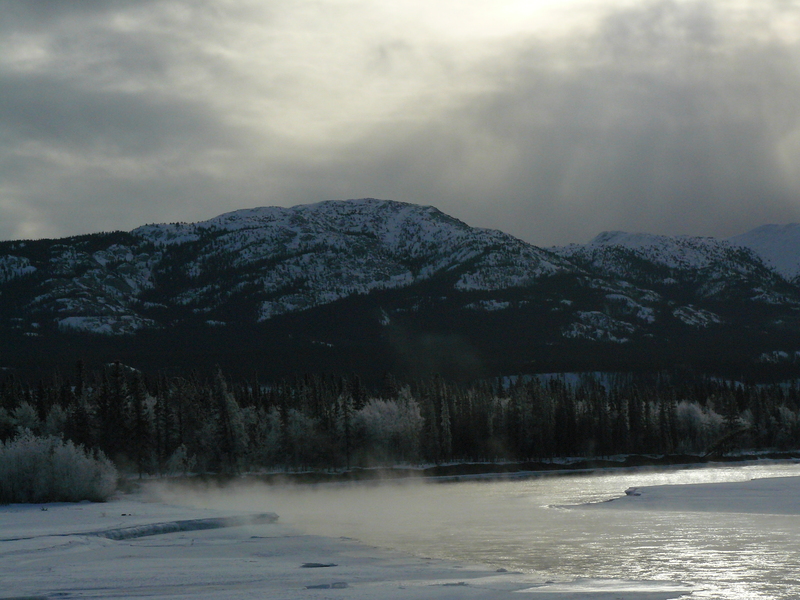 There was the Yukon River now being drained by open water that steamed in the morning sun. Later there were the mountains between the Alaska Highway and here, each dappled with shadow and light. We stopped briefly at Carcross with its views of Lake Bennett and Nares Lake. Open water on the later reflected a great hill that is spotted like an Appaloosa horse. Now there are this series of meadows decorated with the weathered skeletons of tall spruce. Later we will board the ferry for the 6.5 hour ride along a mountain lined fjord to home. Without wind we can expect to see the reflection of each mountain lit up by spring sun. 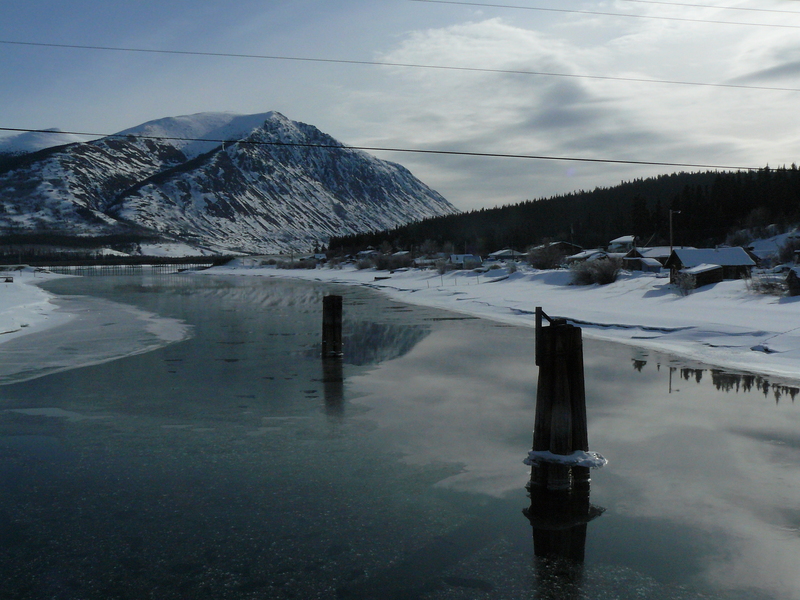 This entry was posted in Dan Branch, Kwethluk, Nature, Southeast Alaska, Yukon on March 27, 2012 by Dan Branch. This Whitehorse ski area is an intersect area where man and wild things coexist. 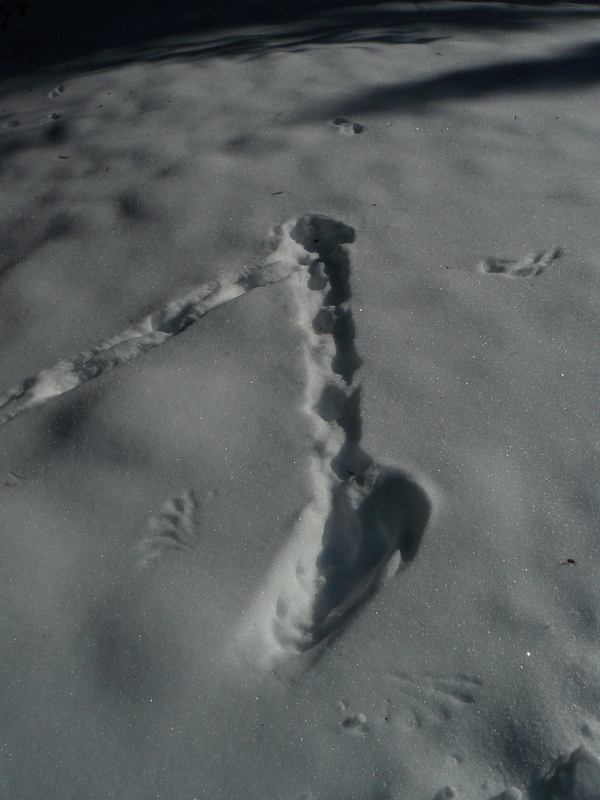 Men move most freely in daylight but the abundance of animal tracks show that they own the night. I choose the smaller, less used tracks that meander through a mixed forest of hard and soft woods. White spruce, some showing the red bark of mature trees space themselves between well formed alders. Yesterday’s overcast skies remain but let though enough sunlight to cast shadows on the snow. Deep in the woods I watch a squirrel wait by the side of the trail like a homeless person timing the crossing of an expressway. Forming a question mark with its tail, it tenses then springs across the ski tracks to the safety of the bordering trees. Minutes later I reach a disturbed meadow where large standing spruce, needless and black, dominates the surrounding willows. A small bird of prey flies from the top of a spruce with a quick flutter, then a glide, and another flutter. I’m surprised to see that the willows have already formed fuzzy catkins which are dropping seeds. 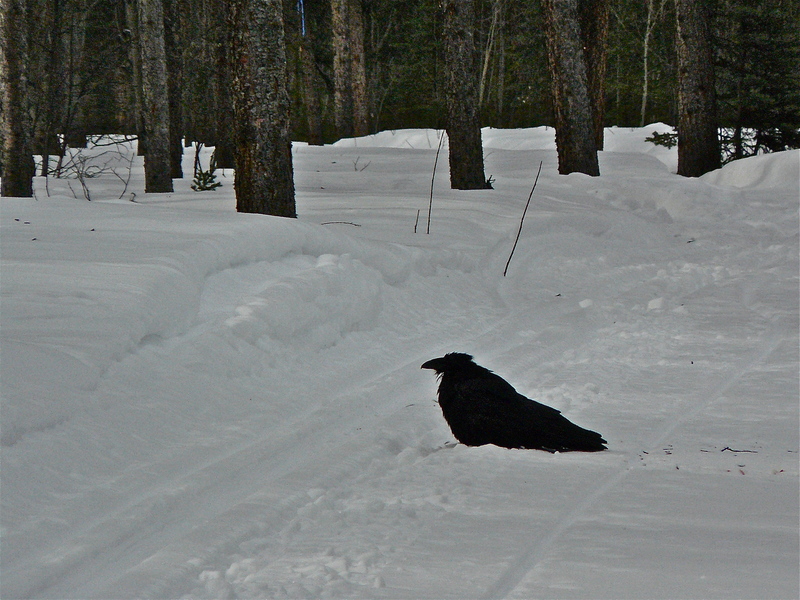 Back in the heavy woods a raven waits by the side of the trail until I stop. Then he waddles into the middle of it and nests down next to the ski tracks. He knows I am coming for I am the train. The train stops and reverses, leaving the bird stranded at the station. Someone has hung an eagle feather at the junction of two trails. It dangles by an almost invisible thread, a tired thing of cinnamon white and brown. The eagle discarded it. Man hung it here where no decoration is needed. 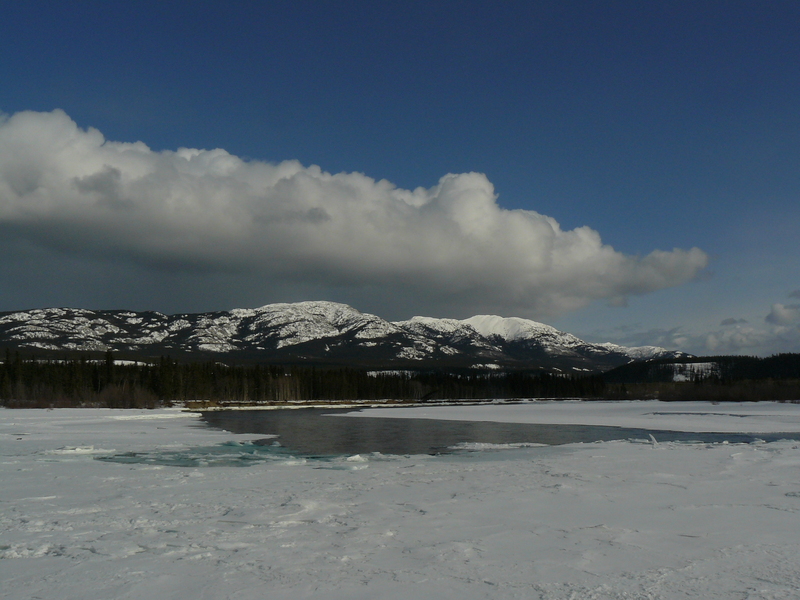 This entry was posted in Dan Branch, Kwethluk, Nature, Uncategorized, Yukon on March 25, 2012 by Dan Branch. A Whitehorse Day in Black and White. We feel a little betrayed by the promising pink sunrise that started the day. 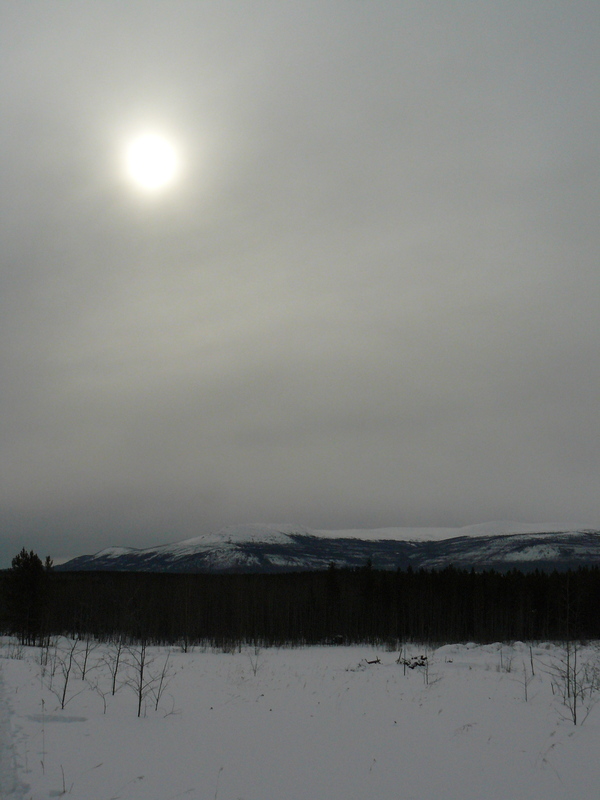 Since then a thin gray cloud layer has blocked the sun from Whitehorse Yukon Territory. 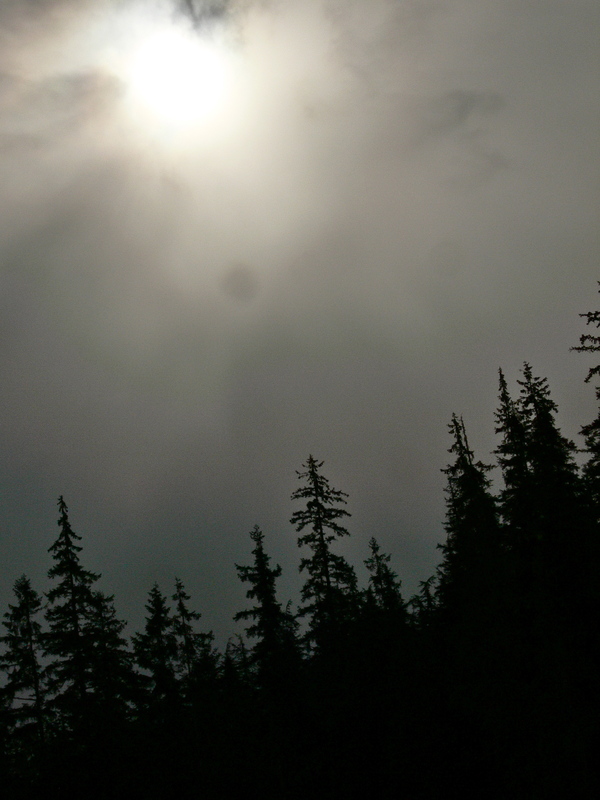 Thin as it is this overcast is made edgy by the sunlight filtering through and offers none of the comfort or drama offered by cloudy days in Juneau. Our hotel is full of Asian tourists here for the Northern Lights. They may have to wait a day or two to see them. 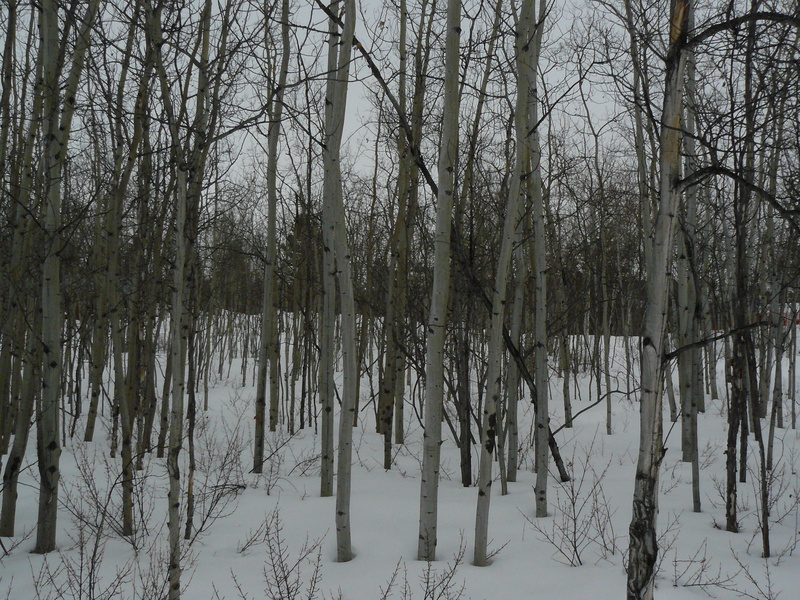 With plans to visit the Canadian Tire store on the way home we drive 35 kilometers north to a hot springs complex where cross country ski trails snake through a poplar forest. It’s good skiing but we miss the drama of yesterday’s ski near Lake Bennett. Moose tracks cross the ski tracks many times but none of the big animals has walked on the tracks themselves. 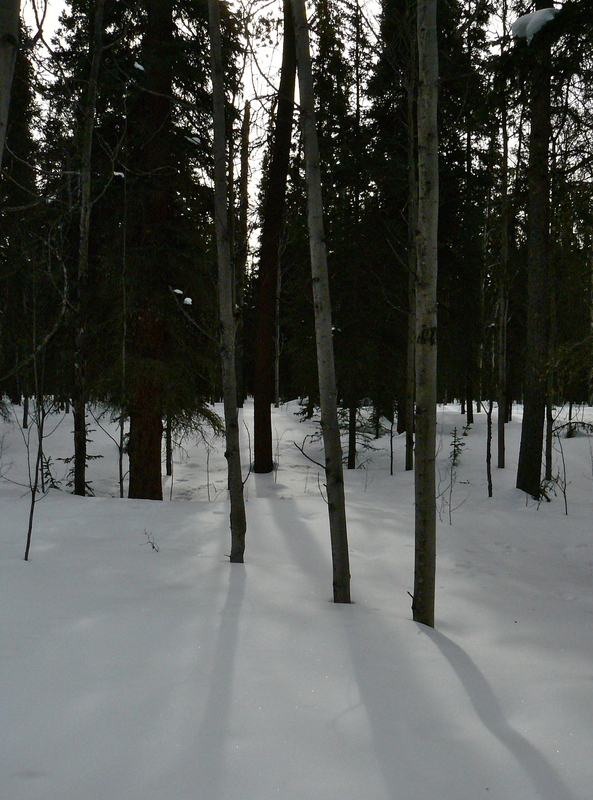 With the forest floor covered with deep soft snow you would expect them to use the packed trails. At one point we passed nearby a moose, which startled us when he broke nosily away. Every though they look like some kind of farm animal moose scare me more than bears. When they take it into their mind to stomp you they persist until you either escape or feel pain. It is worst if you get between a cow moose and her calf. While the gray ski offers little beauty, that of the gray barked poplar forest has all the romantic beauty of a black and white film from the 40’s. The trees have a Scandinavian sense of personal space, leaving a couple of feet between each neighbor. Thin, tall, and always just a little crooked, their trunks rise ten or fifteen feet above the snowy ground before sending out branches. Even then they grow upward like saints in prayer rather than out like an apple tree. 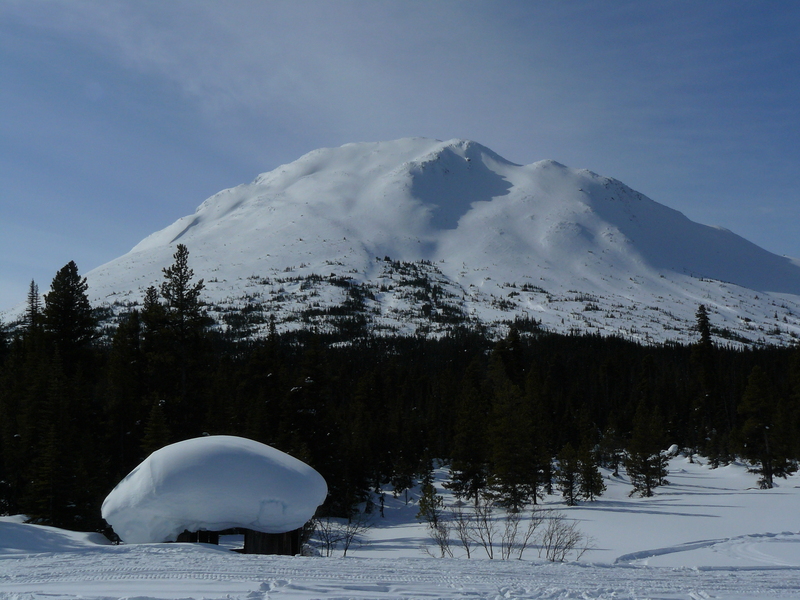 This entry was posted in Aki, Dan Branch, Kwethluk, Nature, Uncategorized, Yukon on March 25, 2012 by Dan Branch. On the Alaska Marine Highway, the ferries always depart at inconvenient times. Today we left Juneau on the MV LeConte at 7 am. While that hour may seem reasonable, we still had to leave the house at 5:30 in order to get the car in the proper loading line. It’s sunny but cold making it bard to spend much time on the deck. 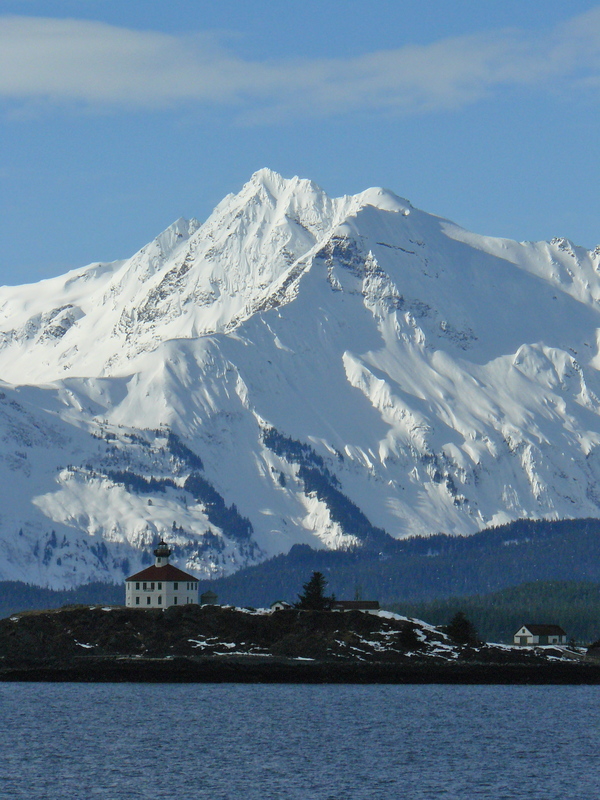 I make an exception for the Eldridge Rock Lighthouse, so isolated in the middle of Lynn Canal. The little block house structure sit on the apex of a rock bare but for a small spruce, probably planted by a previous lighthouse keeper. Today it can hardly compete with the sunlit peaks of the Chilkat Range that rise skyward behind it. It takes six and a half hours to make the trip from Juneau to Skagway, Alaska — all of it beautiful in the sun. I don’t bother looking for whales who are still in transit from Hawaii. We do see one lively Dall Porpoise streaking down the waterfront nears Haines. From Skagway we drive up the steep road from sea level to the Canadian border, passing through several active avalanche areas with signs warning drivers not to stop, With heavy snow loads above the road and warming temperatures I feel like a gambler. Just past Canadian Custom we stop near the terminus of the Chilkoot Trail and ski on rolling trails through a lodgepole pine forest. Some times we drop onto flat pocket meadows which offer views of pure white peaks. Some have captured their own cloud, which rides low over their summits as if pulled down to guard against the harsh sun. Many of the pines lining the trail have big patches of red needles, usually a sign of victimization by bark beetles. Will this whole forest die in the coming years? In 1898 men hungry for gold slayed the trees’ ancestors by the thousands to keep them warm while waiting for Lake Bennett to break up. Then they journeyed down the Yukon River to the Klondike Gold Fields. They cut down many other pines to form the rafts they used for the trip. From the looks of the needles on these trees I wonder if the insects will destroy what the avarice gold seekers could not. Near the end of our ski I spot strange tracks in the snow. They must have been made by a bird, perhaps a raven, who strolled through the soft snow, made a sharp turn and pressed his breast in the snow. So secured, he reached out gently with his winds and made a light scratch with each of the four or five feathers at the tips of his wings. Susan called it a raven’s snow angel. It just confuses me. This entry was posted in Aki, Dan Branch, Florida Keys, Kwethluk, Nature on March 24, 2012 by Dan Branch. The hike starts with a strange sound heard in a familiar place. An angry little sound, hawk like, breaks the silence of morning followed quickly by that of a song bird. The thick forest hides both singers so we move up river. Afterwards I stop often to listen for more bird song but only hear Aki’s paw-falls on the crusty snow. 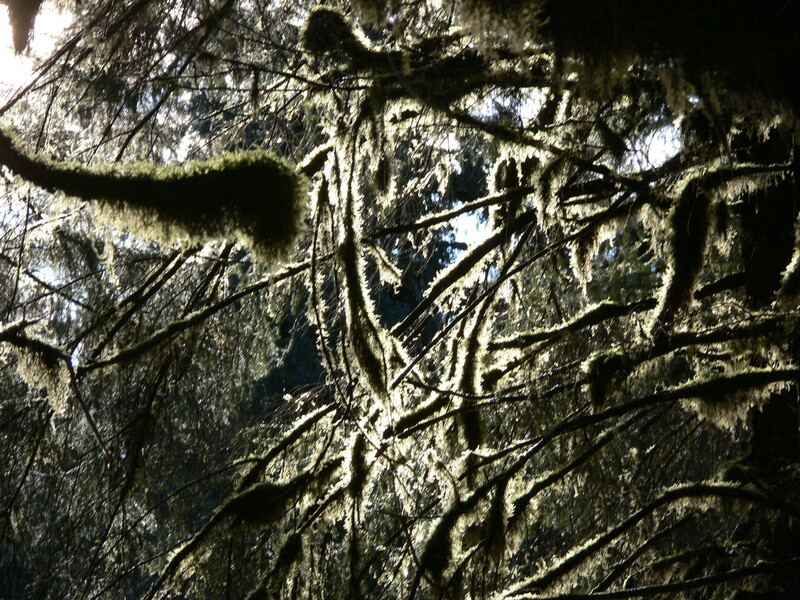 This morning’s low sun backlights the moss covering the big spruce and cottonwoods lining the trail making the moss grow with yellow green tones. I try again to capture a tenth of the beauty with my camera and fail. The place rewards physical, not virtual visitors. Leaving the boreal forest for a muskeg meadow we begin to hear the geese. We have been through this before — hearing a big flock of Canada Geese from this meadow but never seeing them when we reach the beach. Today, the sound stirs Aki to explode down the trail. I find out why when we reach the river with its big meadow covered with geese. Aki has driven at least one bear up a tree but has never before acknowledged the presence of waterfowl. Even today, when they strut openly on the dead grass land and shout out random warnings, Aki acts as if they do not exist. I see this as a sign of sensible caution, not arrogance. Our mere presence, a couple of hundred yards away, seems to set the geese on edge so we keep our distance. Downriver a ringing geese alarm sounds, something like the amplified dithering of the Three Stooges, and a set of geese flies overhead. This is repeated several times — the die hard feeders being driven off their sand bars by a flooding tide. 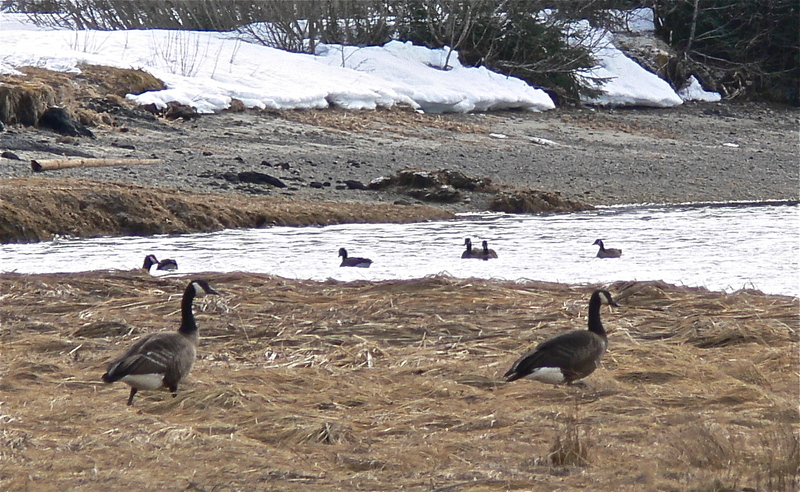 Soon the meadow becomes an untidy barnyard of geese, heads down, looking for a meal. Above them snow whitened mountains rise into a darkening sky. Then it begins to snow. 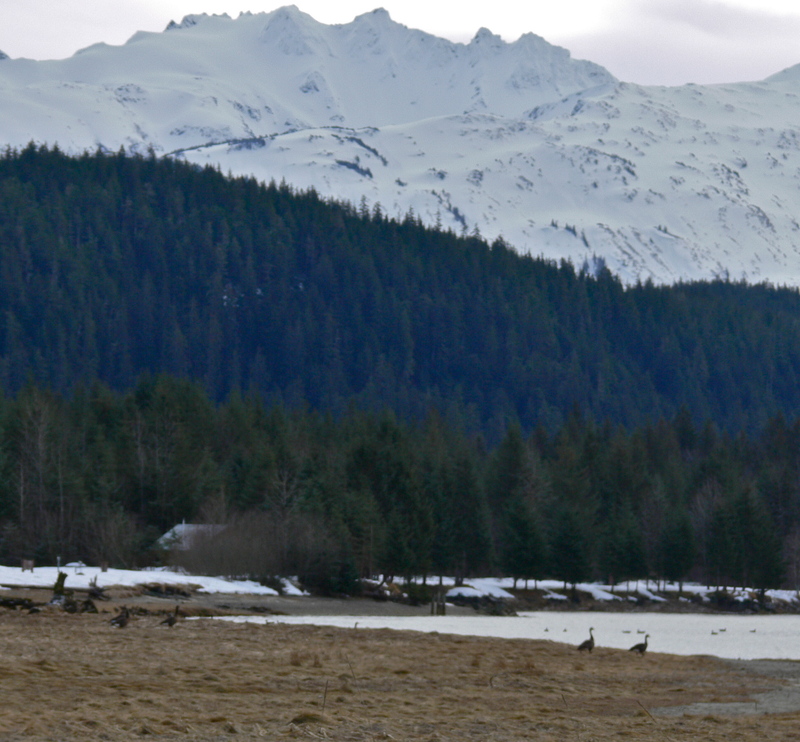 This entry was posted in Aki, Dan Branch, Juneau, Kwethluk, Nature, peaceful isolation, Southeast Alaska on March 18, 2012 by Dan Branch.